Almighty Lord, You have created all things in wisdom. In Your inexpressible providence and great goodness You have brought us to these saving days, for the cleansing of our souls and bodies, for control of our passions, in the hope of the Resurrection. After the forty days You delivered into the hands of Your servant Moses the tablets of the law in characters divinely trace. Enable us also, O Benevolent One, to fight the good fight, to complete the course of the fast, to keep the faith inviolate, to crush underfoot the heads of unseen tempters, to emerge victors over sin and to come, without reproach, to the worship of Your Holy Resurrection. For Blessed and Glorified is Your Most Honorable and Majestic Name, of the Father, the Son and the Holy Spirit, now and ever and unto the ages of ages. Amen. On March 16th Our Holy Orthodox Christian Church commemorates, honors and entreats the holy intercessions of the following Saints, Forefathers, Fathers, Patriarchs, Prophets, Apostles, Preachers, Evangelists, Martyrs, Confessors, Ascetics, and Teachers of Our Holy Orthodox Christian faith: Saint Savinos the Holy Martyr of Egypt; Saint Christodoulos of Patmos; Saint Aristovoulos, Holy Apostle of the 70; Saint Julian the Holy Martyr. THE HOLY APOSTLE ARISTOVOULOS, ONE OF THE 70. He was a follower of the Holy Apostle Barnabas and was born in Cyprus. He was a follower of the Holy Apostle Paul, who mentions him in his Epistle to the Romans (16:10). 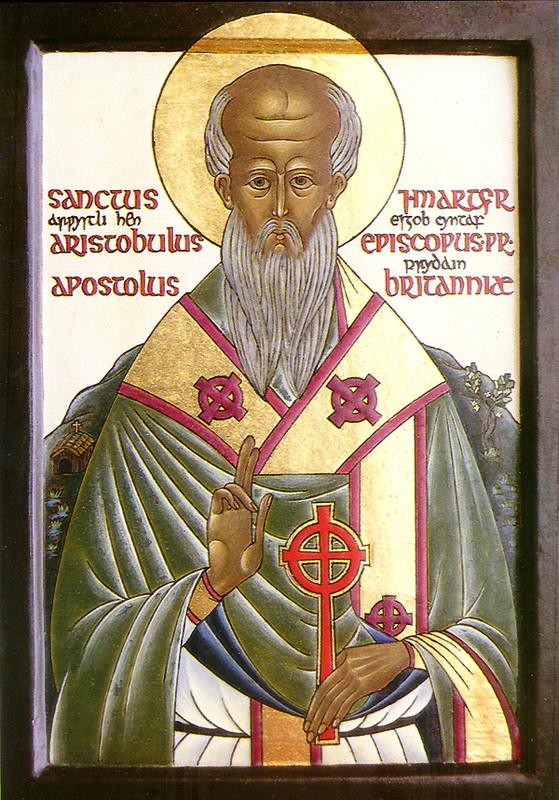 When the great Apostle Paul consecrated many bishops for different parts of the world, he made this Aristovoulos Bishop of Britain (i.e.England). In Britain there was a wild people, pagan and wicked, and St. Aristovoulos endured among them unmentionable torments, misfortunes and malice. They smote him without mercy, dragged him through the streets, mocked him and jeered at him. But in the end this holy man came to success by the power of the grace of God. He enlightened the people, baptized them in the Name of Christ the Lord, built churches, ordained priests and deacons and finally died there in peace and went to the Kingdom of the Lord Whom he had served so faithfully. Christ has conquered the world. This victory is further unveiled and fulfilled in the fact that He built His Church. In Christ and through Christ the unity of mankind was brought about truly for the first time, for those who believed in His Name become the Body of Christ. And through uniting with Christ they united likewise with each other in a most sincere concord of love. In this great unity all empirical distinctions and barriers are done away with: differences of birth in the flesh are effaced within the unity of a spiritual birth. The Church is a new people filled with grace, which does not coincide with any physical boundaries or any earthly nation--neither Greeks nor Jews, and a struggle of faith, through the "Mystery of water," through a union with Christ in the "Mysterious font," through the "grace of becoming sons"; i.e. "sons of God" for Whom "were all things created that are in heaven and that are in earth." In Holy Baptism the one to be enlightened leaves "this world" and forsakes its vanity, as if freeing himself and stepping out of the natural order of things; from the order of "flesh and blood" one enters an order of grace. All inherited ties and all ties of blood are severed. But man is not left solitary or alone. For according to the expression of the Apostle "by one Spirit are we all baptized," neither Scythians nor Barbarians--and this nation does not spring through a relationship of blood but through freedom into one Body. The whole meaning of Holy Baptism consists in the fact that it is a mysterious acceptance into the Church, into the City of God, into the Kingdom of Grace. Through Baptism the believer becomes a member of the Church, enters the "one Church of Angels and men," becomes a "co-citizen of the Saints and ever with God," according to the mysterious and solemn words of Saint Paul--one comes "to mount Zion, and to the city of the Living God, the heavenly Jerusalem, and to an innumerable company of Angels, to the general assembly and Church of the firstborn, which are written in heaven, and to God the Judge of all, and to the spirits of just men made perfect." And in this great throng he is united unto Christ. The Church is a Kingdom not of this world but an Eternal Kingdom, for it has an Eternal King--Christ. The Church is a kind of mysterious image of Eternity and a foretaste of the Resurrection of all. For Christ the Head of the Body is "the life and the resurrection" of His servants and brothers. The measure of births has not yet been filled and the stream of time still flows. The Church is still in its historical wanderings but even now time has no power and no strength in it. It is as if the Apocalyptic moment is forestalled--when there shall be no more time and all time shall cease. Earthly death, the separation of the soul from the body, does not sever the tie between those who have faith, does not part and does not separate co-members in Christ, does not exclude the deceased from the limits and composition of the Church. In the prayer for the departed and in the order for burial we pray Christ "Our Immortal King and God" to send the souls of the departed "to the habitations of the holy," "to the abodes of the righteous," "to the bosom of Abraham," where all the righteous are at rest. And with special expressiveness in these parting prayers on the Mother of God, and on the powers of heaven, and on the holy Martyrs and on all the Saints as on our heavenly co-citizens in the Church. With powerful emphasis the all-timely and catholic consciousness of the Church is disclosed in the order of burial. The faithful who attain to a genuine union with Christ Himself in their struggle and in the saving "mysteries" cannot be parted from Him even by death. "Blessed are they who die in the Lord--their souls shall abide with the blessed." And the prayers for the departed are a witness and measure of the catholic consciousness of the Church. Reverently the Church watches for any signs of grace which witness and confirm the earthly struggle of the departed. By an inner sight the Church recognizes both the righteous living and departed, and the feeling of the Church is sealed by the witness of the priesthood of the Church. In this recognition of its brothers and members who have "attained to perfection" consists the mystical essence of that which in the Christian West (Latin) is termed the "canonization of Saints," and which is understood by the Orthodox East as their glorification, magnification and blessedness. And firstly it is a Glorification of God "wondrous is the Lord in His saints." "God's saints," said Saint John of Damascus, "reigned over and mastered their passions and kept uninjured the likeness unto the image of God, according to which they were created; they of their own free will united themselves with God and received Him into the habitation of their heart, and having thus received Him in communion, through Grace, they became in their very nature like unto Him." In them God rests--they became "the treasures and the pure inhabitants of God." In this the mystery was accomplished. For as the ancient Fathers said--the Son of God became man so that men could be deified, so that sons of men should become sons of God. And in the righteous who attain to love measure of growth and "likening" unto Christ is fulfilled. "The saints in their lifetime already were filled with the Holy Spirit," continues Saint John of Damascus, "and when they died the Grace of the Holy Spirit was still present with their souls and with their bodies in the graves, and with their images and with their Holy Icons not because of their nature but because of Grace and its activity..The saints are alive and with daring they stand before the Lord; they are not dead…The death of saints is more like falling asleep than death," for they "abide in the hand of God." That is, in life and in light…and "after He who is life itself and the source of life was ranked among the dead, we consider no more as dead those who depart with a hope of resurrection and with faith in Him." And it is not only to get help and intercession that the Holy Spirit teaches every believer to pray to the glorified Saints but also because this calling on them, through communion in prayer, deepens the consciousness of the catholic unity of the Church. In our invocation of the Saints our measure of Christian love is exhibited, a living feeling of unanimity and of the power of Church unity is expressed; and, conversely, doubt or inability to feel the intercession of grace and the intervention of Saint on our behalf before God witnesses not only to a weakening of love and of the brotherly and Church ties and relationships but also to a decrease in the fullness of faith in the Ecumenical value and power of the Incarnation and Resurrection. One of the most mysterious anticipations of the Orthodox Church is the contemplation of the "Protecting Veil of the Mother of God," of Her constant standing in prayer for the world, surrounded by all the Saints, before the Throne of God. "Today the Virgin stands in the Church and with hosts of Saints invisibly prays to God for us all; Angels and high priests worship; Apostles and Prophets embrace each other--it is for us that the Mother of God prays unto the Eternal God!" Thus the Church remembers the vision which was once seen by Saint Andrew, the fool for Christ's sake. And that which was then visibly revealed remains now and will stand for all ages. The "Contemplation of the Protecting Veil" of the Mother of God is a vision of the celestial Church, a vision of the unbreakable and ever-existent unity of the heavenly and earthly Church. And it is also a foreseeing that all existence beyond the grave, of the righteous and the Saints, is one uniting prayer, one ceaseless intercession and mediation. For love is the "union of all perfection." And the blessedness of the righteous is an abiding in love.